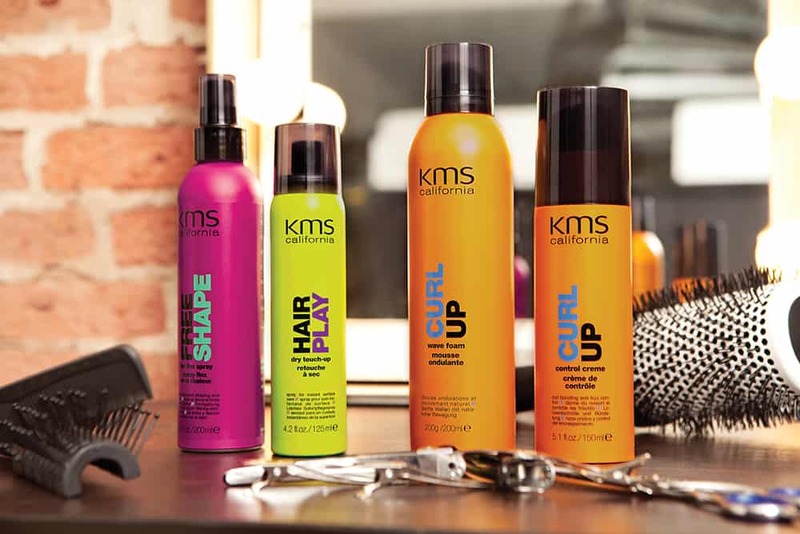 KMS California has a product line for every hair type and style imaginable. Not sure which range you should be using? Check out the handy guide below to find the products that are just right for you! Tame Frizz – Provides instant frizz control and manageability by smoothing the hair surface, conditioning, detangling and adding definition, while providing humidity resistance and heat protection. Free Shape – Helps you create unlimited, long-lasting transformation with hot tools by priming hair for heat styling, increasing manageability and pliability, taming and smoothing cuticles, deeply conditioning and providing heat protection, while promoting anti-breakage and humidity resistance. Add Volume – Increases volume, body and fullness by strengthening and lifting, detangling, enhancing fullness, providing structure, lifting roots and providing targeted volume. Curl Up – Provides curl enhancement, control and definition for natural curls or waves by hydrating and improving elasticity, defining and moisturising curls, providing shine and lasting separation, enhancing wave formation and providing exceptional curl retention. Hair Stay – Provides style retention and durability by removing buildup, increasing manageability, providing long-lasting control and shine, shielding hair from frizz and providing a shiny, weightless finish. Colour Vitality – Provides colour retention and vibrancy for colour-treated hair by sealing in colour, conditioning and restoring radiance, infusing shine, protecting from heat damage and fighting discolouration. Head Remedy – Provides scalp relief for special scalp needs by controlling itching and soothing the scalp. Moist Repair – Provides moisture and repairs dry or damaged hair by improving elasticity manageability, conditioning and detangling, restoring moisture balance, controlling static fly aways and restoring luster. Silk Sheen – Provides instant shine for a natural, polished and effortless style by providing shine, increasing manageability and movement, detangling and conditioning and providing all-day frizz control and intense softness. What is Moroccanoil and How Can it Help You?